Dan Straily – Dan started for the A’s this past Friday going 6 innings, striking out 5 and only walking 1 batter. It was the 23 year-old’s first MLB start after dominating the minors this past year. While it was just one start, there are some encouraging data from the right-hander. * In the AA and AAA this season, he averaged 11.4 K/9 and 2.4 BB/9. While these numbers will not be as good in the majors, some decent results should be expected from him. * He threw 102 pitches in his first MLB start. It seems that the A’s aren’t going to hold him back too much during a game. He should get plenty of strikeout chances. * He should not be shutdown at the end of the season since he is already stretched out for being a starter. In 2011, he threw 160 innings. Using some conventional wisdom that teams only like to see pitchers jump by 40 IP per year, he should be able to go 200 innings this season. That would put him at 55 more innings in 2012. He is looking at 8 to 10 more starts. * He was able to maintain a relatively constant fastball velocity throughout the game. He showed no signs of tiring. 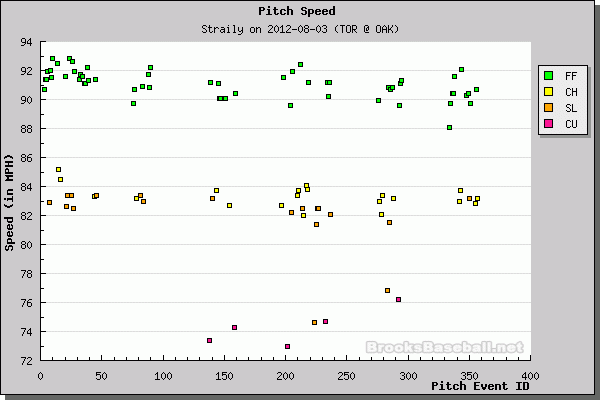 * The one problem I did notice was that the difference between his fastball and change-up was only 7 MPH. A difference around 10 MPH would be more encouraging. Albert Pujols – This past week while building a house, I heard some announcer on the radio state that Albert is turning his season around because he is facing AL starting pitchers for the 2nd time. I decided to do a quick study on just Albert to see if it might be a good strategy to look for hitters facing starters in a new league for the 2nd time. It is true that Pujols is hitting better the second time he faces a pitcher, but that is far from the whole story. I divided his results in games that starters only faced him once into two groups; those he faced in the first 61 games of the season and those he faced over the rest of the season (this group of starters should be expected to be a little worse in talent since that are not making as many appearances). He is crushing 1st time pitchers now. The difference is almost the same (.202 vs 0.194 OPS) as when he sees pitchers for the 2nd time. I know this study is way too small to make any huge conclusions, but Pujols doesn’t seem to have a any real advantage facing a pitcher the 2nd time compared to other pitchers he faces. It is just that he is hitting better in the 2nd half of the season. We hoped you liked reading Straily and Pujols: A Little of This and That by Jeff Zimmerman! Excellent look at Pujols there! Thanks for the work.